The entire floor of the upstairs studio at Dancehouse is lined with a silvery padding. The audience sits in a single row of seats against three of the walls. It’s a bright, aseptic environment, full of reflected light and slender, transparent shadows, with something like the atmosphere of a laboratory or test facility. But instead of quietly humming computers and bubbling alembics, this lab contains an occasional carpenter’s odds and ends. Distributed throughout the space, without apparent system, are three large wooden panels, long and short lengths of two-by-four, a partially constructed wooden frame, a cordless drill and a handful of five-inch nails. There are also five squares of different coloured fabric, a tube of Berocca tablets, five drink bottles, a bunch of bananas and a single coin. 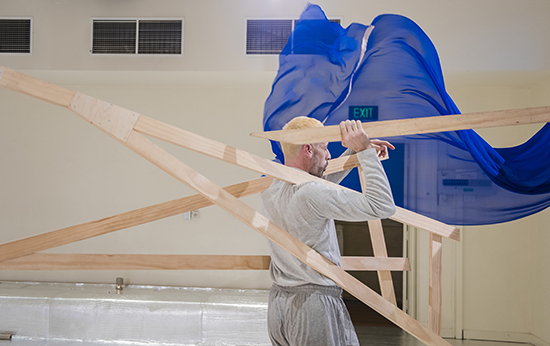 In this largely improvised hour-long presentation, Matthew Day—current artist-in-residence at Dancehouse—probes and modifies, discomposes and recomposes this odd medley of everyday materials. There is no formal beginning and no formal conclusion: the work simply breaks off when Day calls time. Indeed, the final two stagings in this season are billed as “durational performances,” lasting three hours, with audiences invited to come and go as they please. There’s also a library attached to the performance where audience members can consult various theoretical texts which have informed the work. But what does Day do? He snatches up a piece of wood, drags it across the floor and uses it to prop up a large wooden panel. He adds the Berocca to one of the bottles, turning the water red. He drinks it. Then he drinks from a bottle of blue liquid. He eats a banana and throws the skin at a pair of shorts hanging from a rafter. He puts the nails in his pocket and prances across the room, tinkling. A few concrete—and even somewhat gratuitous—images emerge: Matthew Day wrapped in colourful fabrics, like a harem attendant; Matthew Day in his underwear standing on one leg, leaning on a spear, reminiscent of David Gulpilil’s famous pose in Walkabout. As he navigates the room, mapping its irregular features to his instincts and inclinations, Day seems to waver between two distinct planes of movement. On the one hand, there are pulsing bodily contortions reminiscent of the concentrated physicality of his acclaimed TRILOGY series. And on the other, there are the more subdued and undancerly passages where it appears Day is merely performing a task, such as changing costume or manoeuvring lengths of wood. 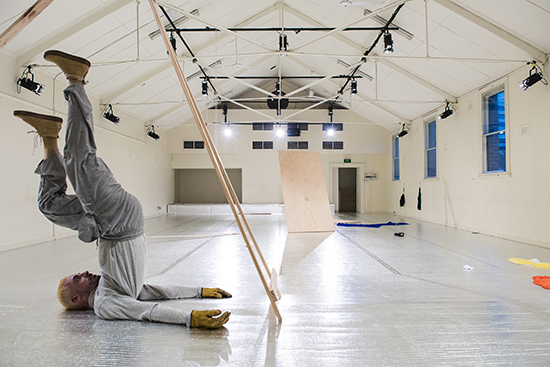 Indeed, in terms of this latter dynamic, this work bears an outward similarity to the contribution Day made to BalletLab’s Kingdom in 2015, which involved performers wandering around a large open space constructing a landscape from mats and long poles. And then there are also traces—like colourful fragments of old posters glimpsed beneath torn remnants of the new—of what looks like a much earlier dance training: a jaunty skipping step, a partial twirl, a loose flourish of the arm. Assemblage #1 is a laboratory piece: an attempt to translate a complex tangle of ideas about the composition and relation of social objects and things into a new form of choreographic expression. There are several long passages where, as if waiting on the results of some obscure examination, Day simply stops, sitting quietly in a corner and observing his apparatus. 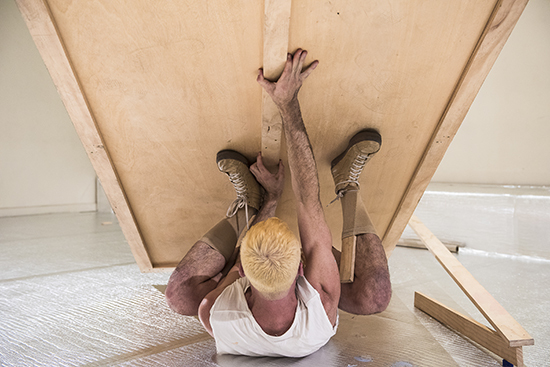 It’s interesting enough as an insight into the artist’s creative processes and his attempt to open new territories beyond those he has already explored, but it isn’t a particularly engaging spectacle. It has little that stirs the senses, fires the imagination or perplexes the mind. The most exciting moment on opening night was when a decayed wood knot caused a long piece of lumber to snap unexpectedly under pressure. This was at least a genuinely spontaneous event. And it was the only time that the doubtful assemblage seemed really functional, with an identity greater than, but still encompassing, the artist himself. But perhaps one hour isn’t enough. Perhaps this is a work that needs to be experienced as a durational event, to allow time for contingent and accidental events to accumulate and flow, and for a more intimate connection with the audience to develop.